Fish lover? Diet? This is the best way to have a diet, fish!fish!fish!, why? Because fish can easy be digested by our body and easy to burn out. Here is one of a delicious food that only here in the Philippines can be found,ever since this kind of food is a favorite of all filipinos. 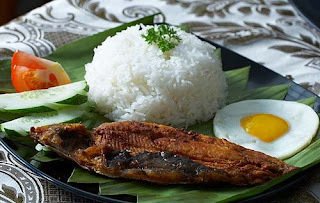 Its called Daing na Bangus(milkfish), look at the picture and I am sure you will appreciate it and hungry! It’s one of the best food I like. Easy to cook, it took my couple of minutes to cook it. Try it! Here is the recipe. Cut your fish lengthwise along the back, taking great care in not breaking the skin. The place the fish skin side down in a a wide and shallow container. Add vinegar, peppers, garlic, salt and ground pepper, and let marinate in your refrigerator for 24 hours, turning the fish over after the initial 12. To prepare, drain, and fry with oil in a large skillet for 5 or 6 minutes, or until the fish reaches a golden brown color. Ang sarap naman ng pagkain dito jaye! mayron ka pa bang tira tira dyan hehehehee!